and I am in love with it. laying on an old chipping rustic bench is perfection all in itself. Seriously, my absolute favorite juxtaposition of rustic and elegant. and then they went right back inside their vase. Which is not really a vase, but this amazing little bit of goodness. to flea markets to antique shops to thrift stores and everywhere in between. This one is not vintage- just vintage inspired- but let's just say that isn't slowing down the love. to the style and to the sheer size of it- which is HUGE. I can hardly wait to show you where it ended up. which makes it pretty perfect for sharing for my Friday Crush. Beautiful!!! Your peonies are lovely! 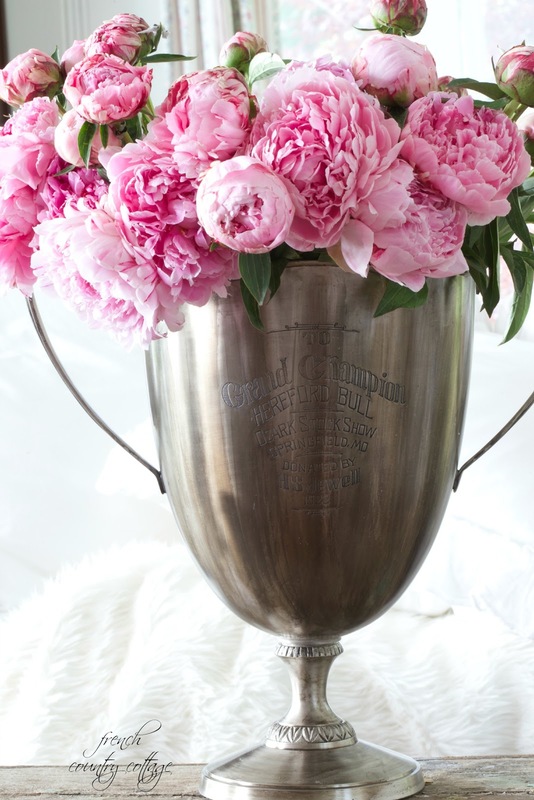 A stunning combination - peonies and the trophy. I will keep an eye out for discarded trophies now as this one makes a beautiful vase. 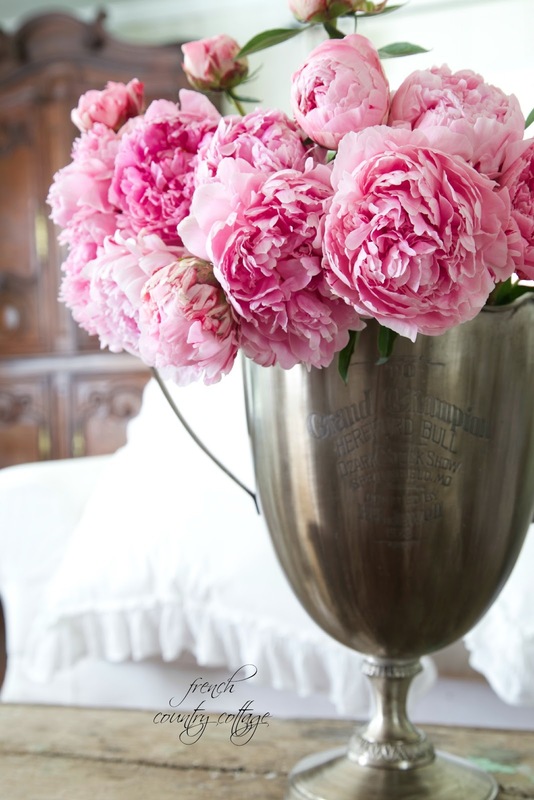 Peonies are one of my most favorite flowers! The are so beautiful and smell so glorious. And yours are so perfect for the championship trophy . . .
Peonies are a new favorite. I like to mix mine with some stock . Great photos. Gorgeous and lush! 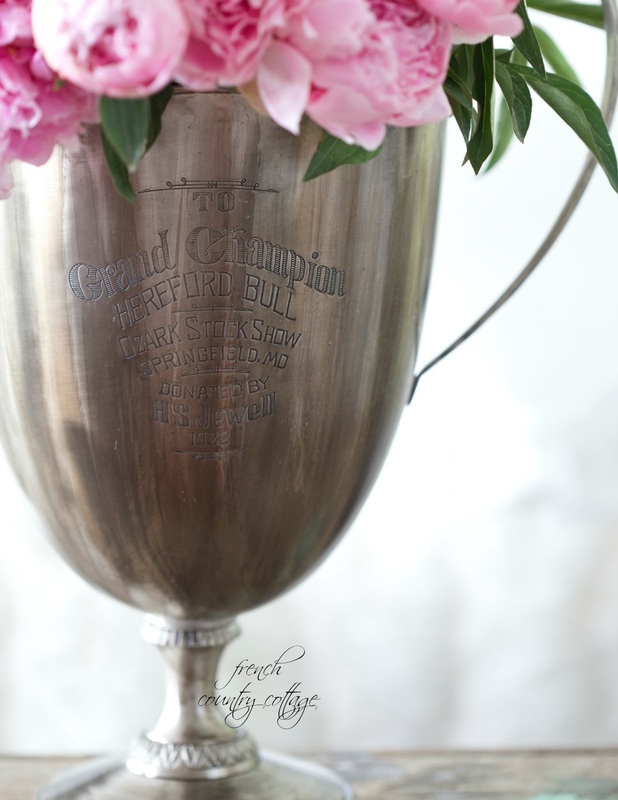 Love the idea of vintage trophies as vases! Thank you Sarah- and thank you for stopping by! 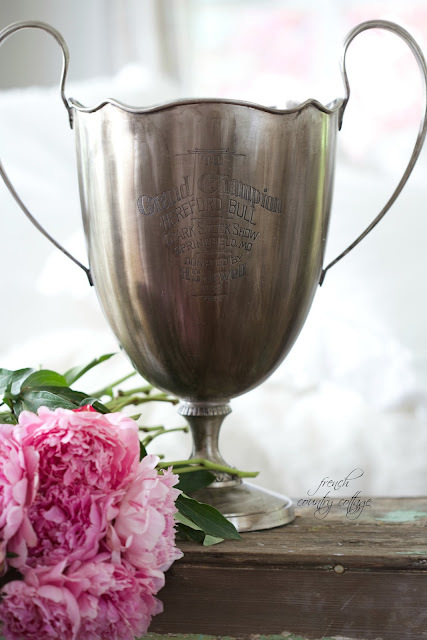 Love peonies and old trophies,they are a good mix.Thanks Courtney and Happy Mother's Day to you,hope you have a great day with your family. Thank you Marlene- hope you had a great weekend! Your flowers are lovely and so beautiful! Love the mix of the trophies with the flowers, creates such a unique, homey and authentic look! 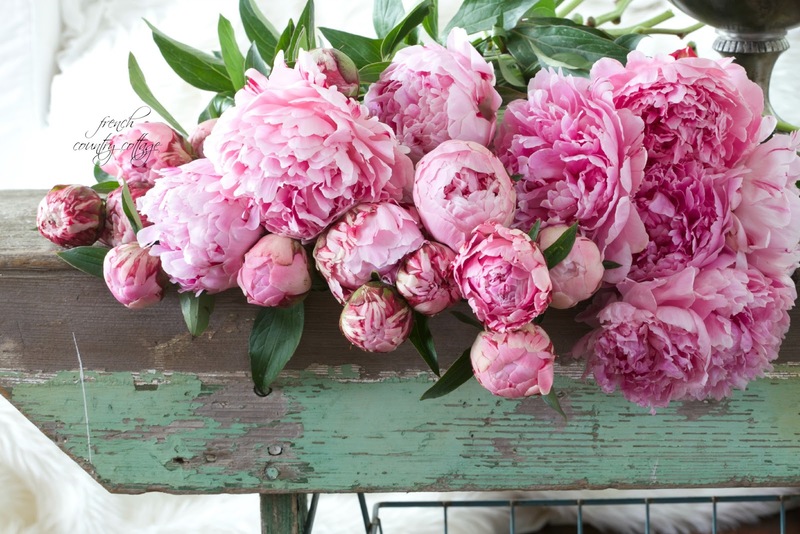 beautiful as usual but why don't your peonies have ants all over them like mine? I live in Alabama where ants and sweet tea go hand in hand also I once googled about the ants and peonies they say they have to have ants roaming nearby as they eat off the sappish topping on the flowers so they will open have you ever heard of this? These are from the market- so, they must clean them off ahead of time. And yes, Ants do something to the flowers to help them to bloom.